Lyle McCartee says: "I had the chance to hang out at the rehearsal site of my favorite drum corps when they came through Leander, Texas, on July 17. I even called in sick to work. 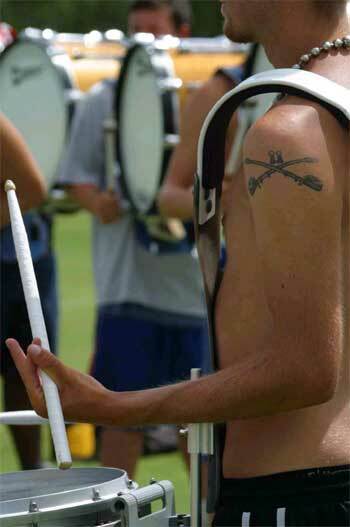 Can you guess which corps I love the most? I like to call this one "Bleeding Cross-Sabers." "I'm a former Trooper who has since shifted my talent from the bass drum to the camera. I took over 300 photos of the corps that day and donated the photos to their promotions dept. I dare say the Webmaster of the Troopers will have her hands full when the corps director hands the CD over to her when they get to Lynn, Mass." Thanks Lyle! E-mail your Forzato submissions -- and we will get to them all, in time -- to dave@dci.org along with where and when the photo was taken. Send some biographical information about yourself as well. We'll give you full credit. Also, let us know if you want your e-mail address included, to get feedback from other drum corps fans.